February 18, 2016 February 18, 2016 / Elizabeth T.
Can you all believe another week has already flown by? 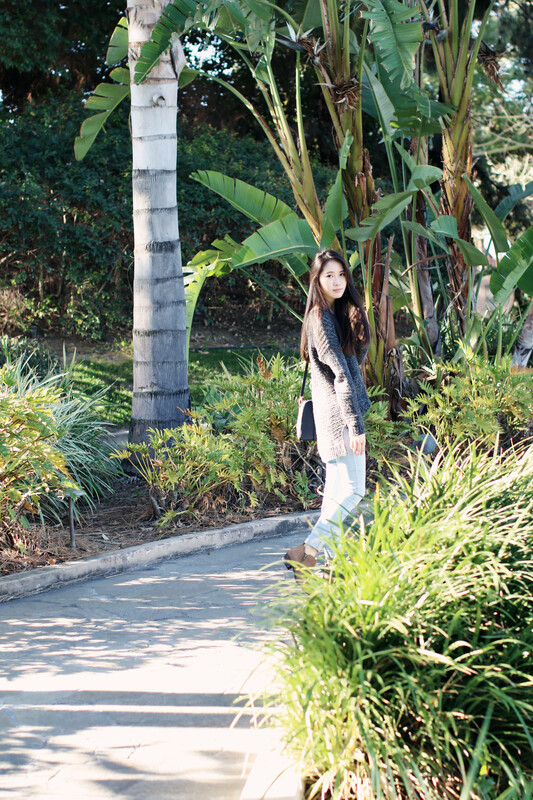 It’s getting closer and closer to spring, and we’re definitely feeling it in LA! Although it’s still pretty chilly in the mornings and nights, the afternoons are definitely warming up, and the sun’s setting later and later too! Sometimes, we can even sneak in some shorts and short walks on the beach to catch the sunset hahaha! It’s raining today, though, but I know that in a few days, it’s going to warm up again! On days like this, I like to make a statement in comfort, which is why this high-low knit sweater is my go-to piece! I love the slits on the sides because it makes it so easy to half-tuck for a chicer, more refined look. Also, the material isn’t too thick, so it won’t be unbearably stuffy throughout the day, making it the perfect sweater as we slowly transition from winter to spring. I love the relaxed fit of it because it’s very effortless, yet the wide neckline and high-low hems make it so chic and stylish at the same time. To finish off the whole ensemble and complete the transitional vibe of this outfit, I opted for my new leather ankle booties. 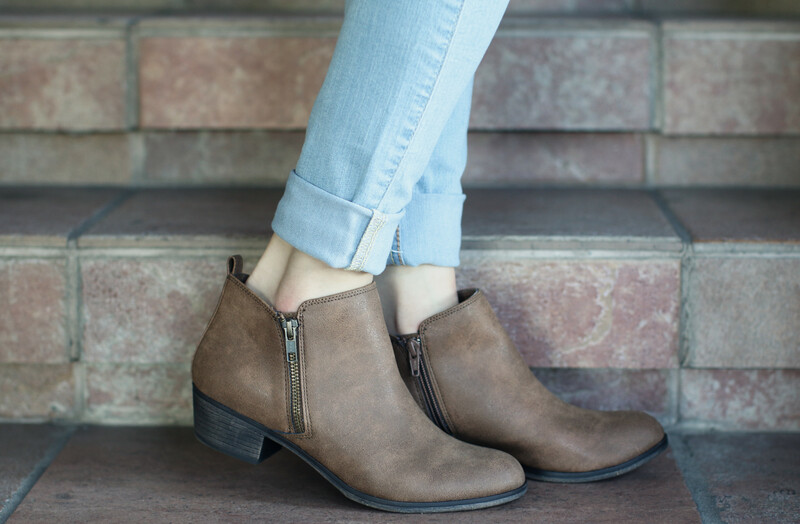 I love how comfortable they are, and the warm brown color is just perfect for the spring! To give the shoes more emphasis, I gently folded up the hem of my jeans, allowing not only my shoes to get more exposure, but also giving my ankles some much needed Vitamin D (since they’ve been hidden for most of the winter months anyway). I hope you all enjoyed this comfortable yet chic high-low knit look! Are you all fans of the half-tuck and the folding-up-your-jeans-trend? 🙂 And are you as excited about the arrival of spring as I am? Let me know me know in the comments! I’d love to hear from you all! Wishing you a great day ahead and a wonderful weekend as well! This is such a nice, chill look. I lovvvve high/low knits. They’re great for layering with an oxford shirt or just getting a tiny bit more dressed up than just jeans and a sweater. Thank you so much love ❤ Haha I love the high-low knits too! It makes for such great layering and styling 🙂 Hope you had a great weekend Pia! Love the little box bag that you’re wearing. Adorable. And I’m such a sweater and jeans person lately, it’s just the comfy choice especially with how cold it’s been! Thank you so much love ❤ I've been using that bag nonstop for the past month 😀 Haha and yes! 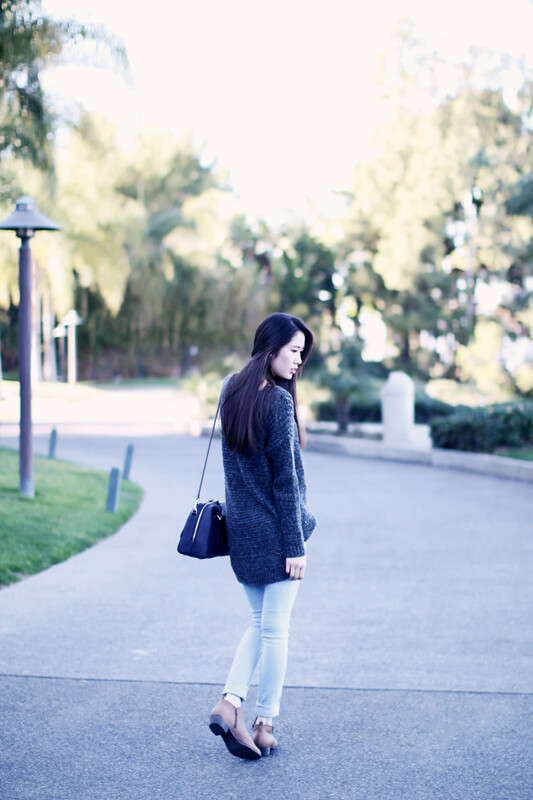 Sweaters and jeans are my go-to winter outfit! The hi-low hem is such a cool detail. Beautiful casual look! Loving this effortless look on you! This is timeless style, can’t never get old. Love the top! I guess I have to try out Hollister more, I didn’t know they had such cute sweater options! Haha and yes you definitely should check them out! I really love your style! So simple, but still very chic! Had to follow you ^^. Thank you Arabella ❤ Glad you liked the look! but yeah, i love half tucking my sweaters as well!! i love effortless look of this outfit, have a great day! Your hair is perfect!!! Confortable outfit! Aww thank you so much Milla ❤ You're too sweet 😀 Hope you liked this OOTD! Cozy casual outfit! Adore it. Thank you so much love ❤ 🙂 Hope you had a great weekend! Such a beautiful casual chic! Love this sweater on you! Thank you so much Jane ❤ You're too kind 🙂 Hope you had a great day! Gorgeous look and perfect pics! I love this! Thank you so much Genevive 🙂 ❤ You're too sweet! Love your outfit. It’s so laid back and effortless. Also, that sweater is the perfect shape! So cute. What a wonderful outfit, absolutely love your knit! Those white jeans are also beyond chic! Effortless Chic! Love the color/texture combos! I love high low tops too 😀 They’re so versatile and chic ❤ Thanks for stopping by Lynne!